Regan’s personality is very different from this point: she is very withdrawn and frightened about what’s happening to her. Chris promises that they’ll find out what’s wrong. She leaves Regan in her bed to sleep and goes to check with her servants but she hears a loud noise and Regan screaming. Chris sees Regan’s bed jumping around, clearly moving by itself. Chris jumps on it to try to stop it but that doesn’t work. Chris takes Regan to see a doctor who thinks she may have a problem in the temporal lobe of her brain and he dismisses Chris’s account of the bed moving as irrelevant. Regan undergoes a series of increasingly unpleasant medical tests and all the doctors can say is that they can find nothing wrong physically. All they can do for her is sedate her. Her doctor recommends Regan sees a psychiatrist. The psychiatrist tries hypnotizing Regan to bring out the personality possessing Regan and after he gets a cheap shot to the balls he runs off. After more examinations by psychiatrists at a clinic they recommend Cathy consider an exorcism, not from any belief in the supernatural but they reason that if believing she’s possessed has caused these problems then believing she has been exorcised may cure her. Police detective Lieutenant Kinderman (Lee J. Cobb) is investigating the death of Burke Dennings. He visits Father Damian Karras (Jason Miller) who works a psychiatrist for the Catholic Church. The head was found twisted right round 180° and it was likely that Dennings was dead before he fell. He wonders if there could be link to obscene vandalism at the church and witches might be involved, Or a deranged priest, which is really why he wants to talk to Karras. Later he visits Chris and tries to find out more about what happened. As Kinderman goes into detail of his theory of how Dennings died he comes up blank when trying to think of who could have done it when there was only a sick twelve-year-old in the house but Chris has an idea the Regan did it. Karras speaks with Regan and gets a face full of pea soup. The demon personality claims to be the devil before doing a perfect imitation of a beggar Karras had met earlier. Karras is still skeptical of the idea that Regan is possessed and once more tries to talk Chris out of an exorcism. He tells her that the Church will need proof of possession before he’ll get permission. Next day he returns with a tape recorder and the demon is taunting him talking in all sorts of languages but just in short phrases. It make things move but refuses to do it on command. Karras fools the demon into thinking it’s getting anointed with holy water and it reacts violently talking in a tongue that Karras doesn’t recognize. When he gets his recording back to the Church it turns out to be English backwards. 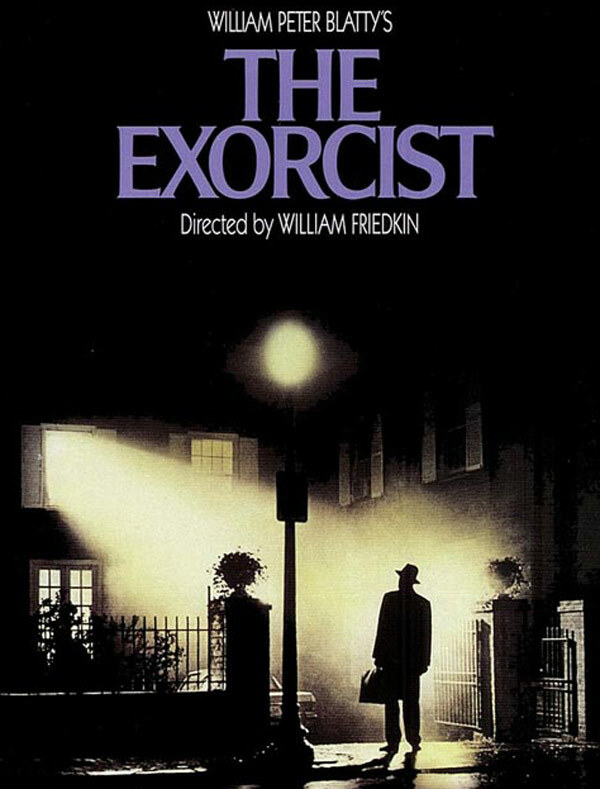 Despite his doubts Karras requests permission from his Bishop to perform an exorcism which the Bishop agrees to but he wants someone with experience to do it and he calls in Father Merrin (Max von Sydow) We saw Merrin at the start of the film working as an archaeologist in Iraq and saw that he was not in the best of health. It was also his name that the demon mentioned in the backwards talk. Merrin arrives at the house and the demon shouts out his name as he enters. Karras is ready to give Merrin the full background but Merrin is not interested. All he needs is holy water and the prayer book and with little preparation he confronts the demon with Karras at his side. The men pray over Regan while the demon tries to distract them with obscenity and abuse. The walls shake and crack and Regan does the 180° head turn and starts directing her abuse at Karras. Regan float up in the air above her bed while Merrin and Karras cast out the demon ion the name all that is holy and spraying her with holy water. Eventually she floats back down and she seems to have gone quiet. Merrin suggests they take a break and the two men are thoroughly exhausted, Merrin is physically exhausted while for Karras it is an emotional exhaustion. Karras sees a hallucination of his mother begging for his help. When Merrin sees how Karras has been affected he sends him out of the room and kneels down to pray next to Regan. Karras sits out in the hallway and Chris comes to ask if its over and Karras shakes his head sadly. Chris wants to know if Regan is going die and Karras promises that she won’t. He goes back into Regan’s room and finds Merrin dead. He tries to restart the man’s heart but its useless and the demon just laughs at his efforts. Karras grabs Regan and shakes her ordering demon to leave the child and enter him. The demon does as he commands and fully possesses Karras. It is about to kill Regan but Karras has still got enough control to send his body out of Regan’s window to die at the bottom the stairs where Dennings was found. Often time is not kind to films but this film is every bit as effective as when it first came out. It takes a while before anything really happens while it builds a picture of the characters so when the film gets to the exorcism itself we know really know who they are and what they have at stake.In particular we have Karras whose plot runs alongside the main demonic possession plot-line and it is a great performance from Jason Miller as the priest who has lost his faith but finds it again when confronting evil demonic power. I also love Lee J.Cobb’s Kinderman with strong shades of Columbo. I rented this out for my 16th birthday party and of course us being teenage girls at the time spent the film laughing rather than being scared. I need to go watch this again and appreciate it.